Does the word Garshana ring a bell? If you have been feeling like having a self-care time and cleaning energies moment, Garshana might be the answer. Or if, on top of that, you would also like to get some help with height problems or that persistent cellulitis. 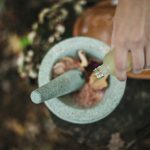 In this article, we present you Garshana, a detox massage for energetic cleansing with ayurvedic exfoliation. Garshana: why is it so good? Garshana is a detox massage with ayurvedic exfoliation, that promotes cleansing, energetic activation and well-being. It uses salt, vegetable oils and herbs. It’s an amazing massage that refreshes and stimulates the skin, the lymphatic system, stimulates blood circulation and promotes the release of accumulated toxins. The word Garshana means to rub! This massage consists of making friction movements, with a bottom-up direction and always towards the heart to help the functioning of the lymphatic system. It focusses especially on the feet, stomach and arms, and each area is massaged at a time, although all body can be massaged. The body is massaged with coarse salt, camphor and essential oil. This essential oil is personalized for every type of skin according to the ayurvedic dosha of the person. The constitutions of the doshas are different for every person and can be examined by an ayurvedic therapist. The doshas are Pita (fire), Kapha (earth and water) and Vatta (wind). This treatment is especially indicated to people with a predominance of the Kapha dosha since these individuals have a higher predisposition to accumulate fat and a hard time to eliminate toxins of the body. It’s a great therapy for cellulitis and obesity, which is one of the reasons why is getting so popular in the Western world. Traditionally, the Ayurveda therapist uses silk gloves or raw linen. The proprieties of the glove, when fractioning the skin provokes energetic changes that interact directly with the nadis (the subtle channels of energy in the body), exponentiated by the salt which also changes the magnetic field of the body and the camphor that open the nadis. For these reasons, Garshana is considered Nadi Shodana, a purifying technique mostly known as pranayama (breathing exercise). It should not be applied on your face or other sensitives areas or inflamed skin. After the treatment, take a warm shower that promotes sweating so that you can make the most of this massage. Another option is to go to a sauna. Afterwards, shower with cold water so that your pores to close, which improves your immune system. With your skin still humid apply oil of your choice. When is not advised to do it? Don’t do Garshana if you’re doing any homeopathic treatment of floral therapy. Don’t do Garshana after eating, if you have fever or any other inflammation, chronic pain or sensitive skin. People that suffer from nervous system disorders, epilepsy, eczema and psoriasis must avoid this practice, as well as pregnant or breastfeeding women. Take some time to care of yourself, your energy and the well-being of your body. Garshana will improve your satisfaction, both mentally and physically, as well as giving a boost to your energy and self-esteem. A great therapy to try soon!